SCHS Future Business Leaders of America chapter is selling teddy bears with candy bags to be delivered to the elementary, middle, and high school on Valentine's Day. 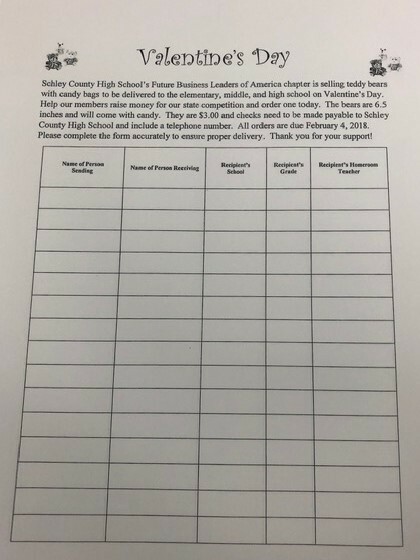 Help our members raise money for our state competition and order one today. They are $3 and checks need to be made payable to Schley County High School and include a telephone number. All orders are due February 4, 2019. Please complete the form accurately to ensure proper delivery. Thank you for your support.